SKU: MBLM. Categories: Perma-Chink, Wood Repair. Tags: EPOXY, EPOXY WOOD CONSOLIDATOR, M-Balm, Mbalm, WOOD CONSOLIDATOR. WHAT IS M-BALM WOOD EPOXY? M-Balm Wood Epoxy is an epoxy liquid that penetrates deeply into porous, deteriorated, dried-out or spongy wood. M-Balm cures and hardens into a strong, water-resistant mass that includes both the original wood fibers and the epoxy mixture. M-Balm restores strength to deteriorated wood. The more M-Balm used, the stronger the restored wood membranes will become. WHAT ARE THE FEATURES AND BENEFITS OF M-BALM WOOD EPOXY? HOW DO YOU APPLY M-BALM WOOD EPOXY? 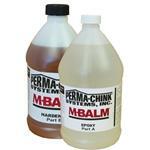 M-Balm is a two part epoxy. Mix two parts of M-Balm Epoxy Part A with 1 part of M-Balm Epoxy Part B by volume. Mix no more than can be applied in 30 minutes. M-Balm can be applied with a squeeze bottle, syringe, brush, or roller. The surface where M-Balm is applied must be very dry with a moisture content of 15% or less. In cases of deep rot, drill a series of holes into the decayed area and squirt the M-Balm liberally into the holes. Allow plenty of time for the M-Balm to soak into the affected area. Apply additional M-Balm as needed. Before finishing allow M-Balm t5o cure for 12-24 hours. M-Balm cures slower in colder temperatures. The application temperature for M-Balm is between 40 degrees and 90 degrees. IS M-BALM WOOD EPOXY SAFE TO USE? M-Balm is safe to use according to the manufacturer’s directions. Always wear disposable gloves when using this product. Skin sensitization may result from prolonged and repeated contact. Use this product only in areas with adequate ventilation. Do not use product around open flames. HOW DO YOU CLEAN UP UNCURED MIXED M-BALM WOOD EPOXY? Uncured mixed M-Balm may be cleaned up with white vinegar and then flushed away with water. WHAT FINISHES WORK BEST WITH M-BALM WOOD EPOXY? M-Balm is water resistant so film forming finishes such as Lifeline Ultra 2, Lifeline Ultra 7, and Sikkens Log and Siding work best over M-Balm treated surfaces. Penetrating finishes such as Q8 Log Oil and Seal-Once do not work well with this product as they will not penetrate into the epoxy. WHAT COVERAGE CAN YOU EXPECT WITH M-BALM WOOD EPOXY? M-Balm coverage varies based on the porosity of the wood surface to which it is applied. Be the first to review “M-Balm Wood Epoxy” Click here to cancel reply.